Never owned a 911 but hoping to move into one soon. My dream car has always been the gt3. For sone background I would use the car as a DD in heavy LA traffic. But I also have used cars for this commute you wouldn't normally use, a BMW M3, Clk63 black series and then currently a c63 black series. So I'm ok driving "stiff" cars daily. So to me "comfort" means more then specifically a hard ride, but the complete package of steering, gearing, responsiveness, interior noise levels, along with suspension compression and rebound. 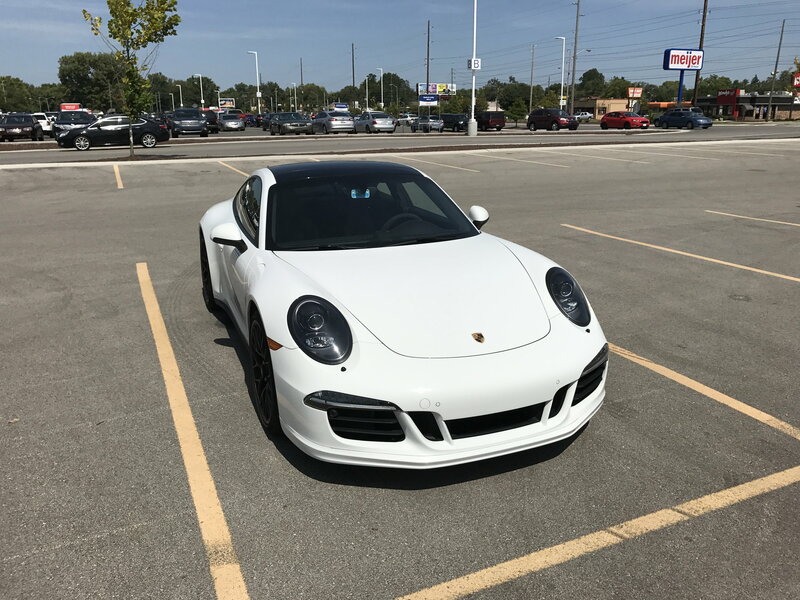 I got to drive a gt3 on a long test drive and loved the car and thought that it would be doable as daily. It wasn't my ideal as a daily mostly because of the clutch rattle noise and the quick sharp response to controls which demand some attention. I felt that noise specifically might get annoying sitting in traffic for an hour. So I didn't go with the gt3, as stupid as that might sound. On a weekend the sound would be fine. When I need to tune the world out it would drive me crazy. But now I'm thinking of GTS (targa). To my surprise there aren't any available for test drive right now around me. Last edited by darkus; 04-14-2019 at 09:52 PM. Any Carrera is a far better and more sensible daily driver than a GT3. I know there are people who DD their GT3s, but it wouldn’t be close to my DD choice. But now I'm thinking of GTS (targa). To my surprise there aren't any available for test drive right now around be me. I traveled the same journey. As a Rennlist member stated "a GT3 is a track car you can drive on the street, where the GTS is a street car you can drive on the track." If found this statement to be 100% true. I bought a 991.2 GTS and haven't looked back. I have a 2017 Targa GTS and debated on a GT3. While I love the GT3 and have test drove a 991.1 GT3. The Targa GTS would be much better as a daily. The Targa GTS has everything one could want in a street car in my opinion. Plenty of power, comfortable, not too low to the ground and no need for the front axle lift in my experience, the looks, ability to have partial top off, handles amazingly, can take it to the track if you wish. The GT3 is an amazing raw machine and ready for the track. It just felt like it would be begging me to redline it all day. The GTS can be driven along comfortable and tame in the city and not pressure you as much to run it out all the time. I also benefit from the rear seats having an 8 and 5 year old. The debate was long and hard for me. In the end I realized that I would get way more enjoyment as a daily driver out of the Targa GTS vs. GT3. This is over 95% of my cars usage. The other 5 is heavily spirited back road runs and track use. In that 5%, I would get more out of GT3. So, I went with the 95%. Yes I wish I had bucket seats and a harness also ability to put in a half cage without destroying my interior. However, the trade off is worth it. I didnt test drive my car before purchasing. I test drove a 991.2 GTS and a 991.1 Targa GTS. I was able to mesh the two together and know what I was getting into. See if you can find any 991 Targa regardless of power trim and then find any 991.2 GTS and you should be able to figure out if it is what you want. The GT3 is an incredible machine and I want one. But it's more track oriented, and lacks the comfort mode of my PDCC. And GT3's lack a sunroof, cooled perforated leather seats, as well as Bose/Burmeister. Many GT3's lack Keyless entry & parking sensors. GT3's lack rear seats, altho I would gladly give up my rear seats for weight savings. As much as I love the wing the GT3 has and as much as I love most of everything the GT3's have, its still not for me. I like some track time in my Porsches, but I'm not a track rat. And I want my luxury loaded 991.2 street machine to have all its luxury and performance options and 470 Hp 406 ft-lbs torque, the way it sits (X51 PowerKit S Endurance Racing Edition with all performance options and plenty of lux options, catless downpipes and incredible exhaust sounds). With future COBB AccessPort and tune, and BMC filters, it is soon going to have an enjoyable 540 Hp and 495 ft-lbs torque, on plentiful 93 octane Premium available everywhere I drive. And I like 5 lug wheels versus the Centerlok wheels. I might add a wing in the future. Each of us has his/her wants, needs and priorities. Which are yours? Last edited by PCA1983; 04-14-2019 at 11:16 PM. I have both at 991.1 GTS cab (PDK) and a GT3T. I am a huge fan of the GTS as a daily driver because it is more nuanced than the GT3. As you alluded to, the GT3 is always in beast mode. The GTS can be driven in normal mode with PSE off and it feels like a luxury sedan to me. It makes for a great grand tourer because it is remarkably quiet going 88ish mph on the highway (in normal mode with auto start/stop deployed). Like you, I like to relax when stuck in LA traffic. My GTS allows me to do that. But if I am in the mood, I put it in sport mode, manual mode, PSE on and wow, what a beast it becomes! For me, the GT3T is for mentally, physically and emotionally engaging driving in the canyons, up the coast and for short road trips (say, 90 miles up the coast to Santa Barbara). Driving the GT3 with a manual requires much more attention, not to mention that the car is a caged beast whose power needs to be respected. Perhaps as I get more seat time in the Touring, I will become more of a proponent of DD'ing it but for the time being, I am going to stick with the GTS. Not to mention that I love the top down driving experience and my Burmester stereo (which is not an option in the GT3). So nice to be able to get some fresh air, listen to some of my favorite tunes and hear and smell that sweet NA flat six after a long day at the office. Lots of good feedback and I agree with most of it. I have a GT3 Touring and a 991.2 C4S. The later is my summer DD. It makes me wonder why I have the GT3 because as others noted the cars have a split personality. In “normal” mode they are luxury cars. In Sport + they are fantastic sports cars. Good luck. Thanks everyone! Sounds like the GTS is a no brainer in my situation, and will be almost as fun as a GT3. For your driving interests, the GTS will be considerably more fun. My 991.1 GTS that I had for 3 years was definitely dual personality. In Sport + it was nice and loud, and of course not the fastest around (991.2 S would likely beat it) but it was quite the looker. I went 991.2 TT eventually but I actually loved the Alcantara in the interior- not a huge fan of the Carmine red stitching but the car was fun. I will say this, there is nothing stopping you from dailying a GT3. I actually find my GT3 too refined and plush for my tastes.